This weekend I was down at the RBC Center to attend Jon’s sister’s graduation from North Carolina State University (mazel tov Holly!). After the three hour ceremony Jon and I decided to take advantage of our proximity to the NCMA and see the 30 Americans and Anthony Goicolea shows. First, though, we had to eat, and we decided to try the NCMA’s restaurant, Iris. I’ve had some good meals at the NCMA pre-renovation, during my internship. The new restaurant space is like much of the new building: a mix of elegance and industrial in its spareness, bright, open, clean, and white. I had an omelet with some sweet potato fries, Jon had a burger that he seemed to enjoy. The sweet potato fries were actually crispy. I love sweet potato fries in general but I often find them soggy. Somehow Iris has managed to fix that problem. Regardless, if you need a bite at the NCMA Iris is a good, classy, moderately priced option. We then crossed into the old building, where the museum now holds their temporary exhibitions. Two in particular are fantastic: 30 Americans and Alter Ego: A Decade of Work by Anthony Goicolea. 30 Americans presents selections from the Rubell Family Collection in Miami, Florida. The works are drawn from the oeuvres of 31 African American artists, and their depictions of their personal experiences as African American vary from technicolor realism to literary sparseness to abstraction. The exhibit has work by some of my favorite artists. Precision cut-out silhouettes of a fantastical vision of African American history by Kara Walker. 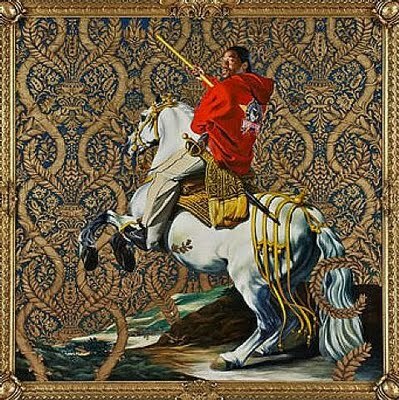 Giant precisely rendered, brightly colored, detailed portraits of contemporary African Americans in renaissance settings by the great Kehinde Wiley. The spare, word-centric works of Glenn Ligon. 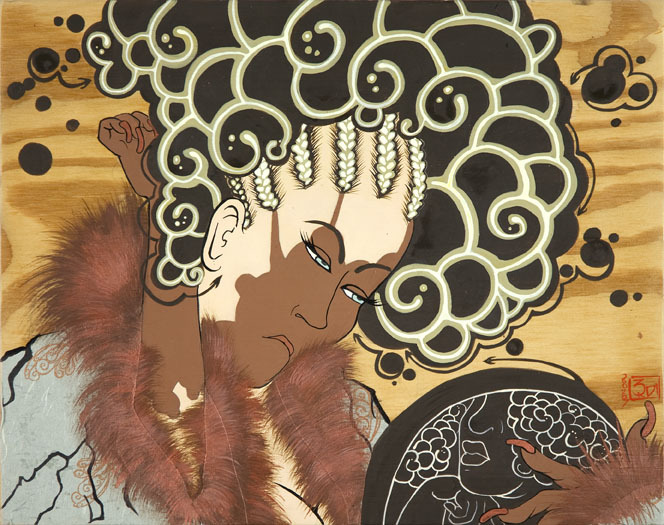 The awesome, awesome, awesome ukiyo-e style images of Japanese in Afro-urban dress by iona rozeal brown (love her!). Sprawling, eerie collages by Wangechi Mutu. The photographic plays on advertising and stereotype by Hank Willis Thomas. Even some Barkley Hendricks, David Hammons Lorna Simpson, and Carrie Mae Weems for good measure. Let’s just Rubells have their bases covered when it comes to the major artists in the contemporary African American art cannon, and if you were unfamiliar with African American contemporary art then this would be an amazing introduction. I also discovered fantastic work by artists with whom I was unfamiliar. Mickalene Thomas creates these amazing, hyper-colored, semi-realistic depictions of African American women and then decks them out in sequins. Nick Cave creates “sound suits” that are part traditional West African masquerade, part drag queen, part incredible theatrics. The work displayed in this exhibit is definitely top notch. I did wonder why the Rubells chose certain artists rather than others–for instance, where was Adrian Piper? Additionally, I didn’t see much of a “theme” to the exhibition. I understand this is a fantastic collection of African American art work, acquired by the very discerning Rubells, but beyond that I’m not sure what story the curators are trying to tell with this exhibit. Regardless, if you are looking for quality of works you could not do much better. I highly, highly, highly recommend heading to the NCMA to see 30 Americans before it closes. The other exhibit we visited was Alter Ego: A Decade of Work by Anthony Goicolea. 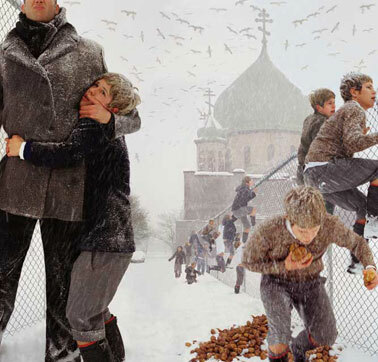 Anthony Goicolea is an American-born artist of Cuban descent who currently lives in Brooklyn. He creats digitally altered photographs and painting-collages depicting dark, melancholy, fantastical worlds and eerie spins on childhood. His works are deeply layered and a single piece can tell an extremely complicated story. This is a quieter, more introverted show than 30 Americans, and I think the two exhibits compliment each other in terms of differing forms of contempory art, representation, and narrative. The Goicolea show is like a chilly forest, drawing you into the sinister details of the art. 30 Americans on the other hand, is a big, colorful, brass explosion. The NCMA’s choice to show these shows at the same time is a fantastic one, and demonstrative of the museum’s growing commitment to the exhibition of contemporary art. Alter Ego: A Decade of Work by Anthony Goicolea closes on July 24th and 30 Americans closes on September 4th. Get yourself to the North Carolina Museum of Art immediately to see these two fantastic shows!